Listed below are some of the events that took place during Expo 86 special tribute to water travel. Ships of the World: July 18-21. Marine vessels of all varieties met in Vancouver. Tall Ships, tugboats, fishing boats, yachts and canoes all sailed past Expo 86. Boats of all types powered by steam, wind, electricity, and oil were represented. Dragon Boat Festival: June 14-15. 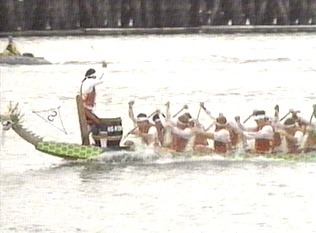 Established in China during the Chow Dynasty, 11.5 meter dragon boats powered by 20 paddlers raced to the beat of the captain's drum. Introduced at Expo 86, this festival is a legacy which still takes place every year. Riverwork Boat Parade: July 27. All forms of working vessels, tugboats, fishing boats, firefighters and more paraded from the Fraser River to False Creek. Wooden boat Festival: August 10 - 18. 40 wooden boats with historical significance or classical features were displayed at the Marine Plaza. The Minnow, famed for its role in the 1960s television classic "Gilligan's Island" was on display.